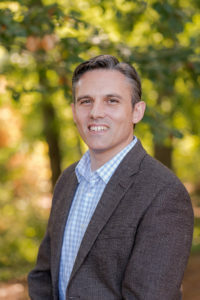 Aaron came to Mount Vernon in June 2008 after completing his Masters of Divinity in Biblical and Theological Studies and his Ph.D. in American Church History from Southern Seminary. Prior to pastoral ministry, Aaron worked as a legislative assistant to the late U.S. Senator Mark O. Hatfield. After leaving his career in politics, he went on staff and served as an elder at Capitol Hill Baptist Church in Washington, D.C. While in seminary, Aaron served as an elder and interim pastor at Third Avenue Baptist Church. Aaron is the organizer and host of Feed My Sheep, an annual conference for pastors and church leaders in the Atlanta area. He also serves on the administrative team of the Greater Atlanta Baptist Network where he leads a monthly pastors fellowship. In addition to pastoral ministry, Aaron is a visiting lecturer at Reformed Theological Seminary (Atlanta), and the author of Politics and Piety: Baptist Social Reform in America, 1770-1860 (Pickwick, 2014).